As British sport appears to be booming with success, this weeks attention turns to Cricket with the first Test of The Ashes at Trent Bridge. This is an important event for Nottingham to showcase the City to a global audience. On Monday night this week I was a guest of Couch Perry Wilkes and Interserve Construction at a Black Tie Investec dinner at Trent Bridge. This was to launch The Ashes week. It was a great dinner in a stunning location. 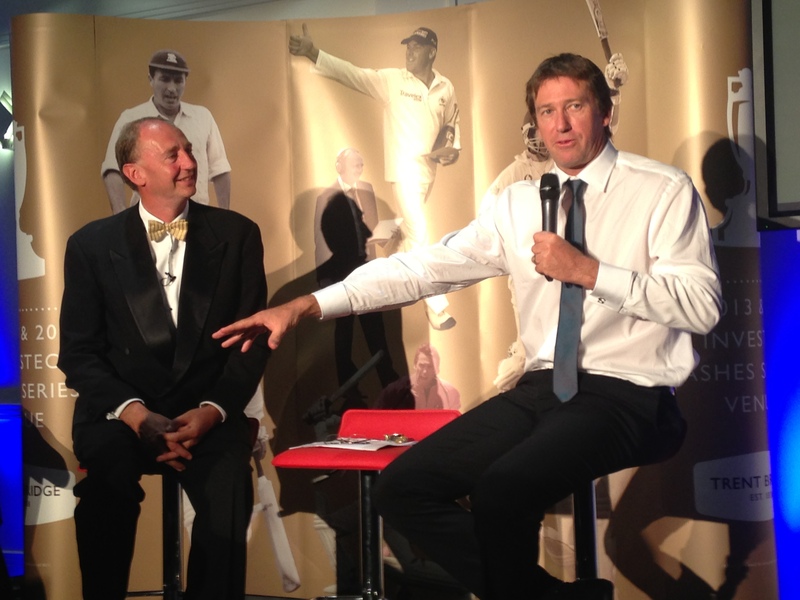 Our hosts/ entertainers for the evening were David “Bumble” Lloyd, Jonathan “Agers” Agnew and ex-Aussie player Glenn McGrath. These guys were on good form, Bumble was positively hilarious! I’m back there again today watching the second day of action as a guest of Freeth Cartwright in the Hound Road upper tier. The Ashes series dates back to 1882 when England played Australia at the Oval – and lost. The British Sporting Times newspaper published a mock obituary stating that “English cricket had died, and that the body will be cremated and the ashes taken to Australia”. The following series between England and Australia was then dubbed “the quest to regain the ashes”. During this series a group of Melbourne women presented a Terracotta urn to England captain Ivo Bligh, the contents of which were reputed to be the ashes of a bail from the wickets. The series is now the one of the most popular and celebrated in the sport and the urn has become the ‘prize’. However, these are always replicas of some form. The original urn, which was gifted to the MCC by Bligh’s widow, lives at the Marylebone Cricket Club Museum at Lord’s. England are the current holders of The Ashes and look set to retain the title this year (hopefully!). However Australia have won it the most times (31), but a series win for England this year will put them level. 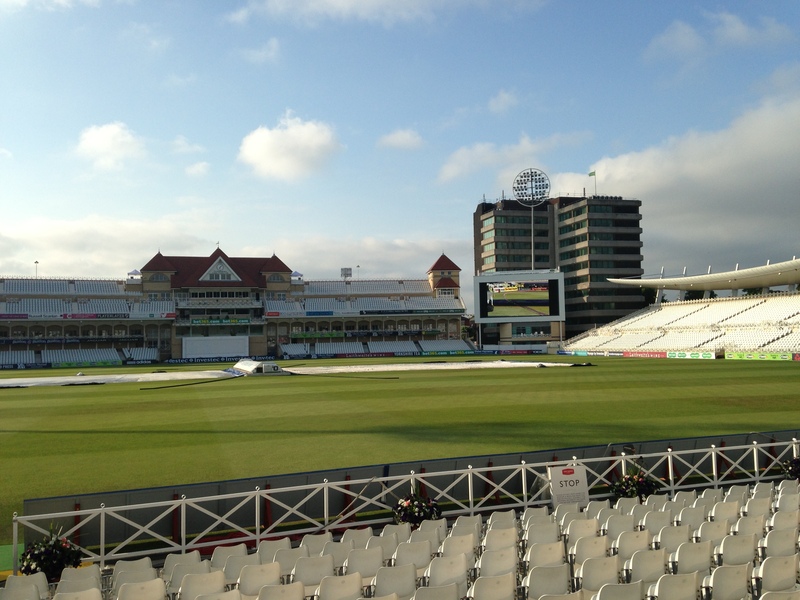 Trent Bridge pre-dates The Ashes as it was first used as a cricket ground in the 1830’s. The first test match hosted there was in 1899, between England and Australia. The ground was officially opened in 1841 by William Clarke, the captain of the All England Cricket Team and husband of the proprietress of the (world famous) Trent Bridge Inn. There is a stand at the ground in his name now. Trent Bridge has changed a lot over the years, especially recently with a number of new stands and floodlights. However the original Pavilion building, dating back to 1889, remains largely the same as it was and regarded as a trademark to the sport. Today the ground can seat 17,100 people and its most recent addition is Europe’s largest outdoor video screen which partly masks the County Councils office block built in the 1960’s and cost £1.8m. Trent Bridge is a great historic feature of Nottingham and has evolved well over the years. It’s great to see The Ashes here again and its good for Nottingham’s economy. Fingers crossed England will win this first Test and the whole Series in due course. Cricket certainly isn’t dead today. 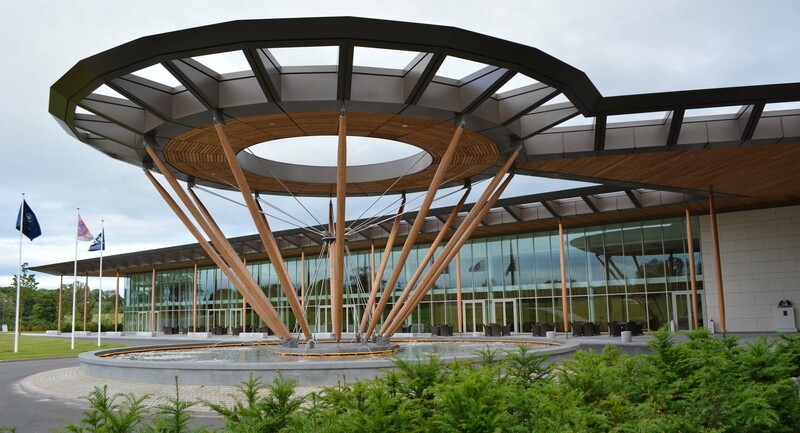 I have recently been on a tour of the Football Association’s new St. George’s Park National Football Centre in Staffordshire. Its an impressive multi-use facility which has taken years to realise. The FA historically have used Lilleshall Hall in Shropshire as their England team training facility, a place steeped in history as the 1966 World Cup winning England team trained there. It became a formal FA School of Excellence in 1984 and was closed in 1999. St. George’s Park was formally part of the Needwood Estate owned by the Berkeley Family, it was later owned by the Crown before the Bass family owned in from the 1850’s up until the 1950’s. Forte Hotels put plans in place to redevelop the site into a hotel complex, but these were shelved after Planning had been granted. The FA acquired the 330-acre site in 2001 for £2m. Proposals were developed in the early 2000’s, but funding issues, related to the Wembley Stadium development, stalled the project for a number of years. In 2008 the decision was taken to build the development and Newcastle based Architects Redbox design were appointed. The £110m project was completed in July 2012 and officially opened by the Duke and Duchess of Cambridge in October that year. The building complex is rather secluded as you enter the main entrance off the road. The winding approach drive, flanked by football pitches named after England legends, reveals a dramatic entrance to the Hilton hotel(s) on the site. The FA’s football centre is located behind the hotel, which doesn’t feel altogether natural given that is the main function of the whole site. I guess a layering of public/ private use on the site informed this back to front arrangement. The impressive 4*+ Hilton hotel provides for your every leisure/ business need. It includes extensive corporate conferencing facilities & business centre, A Spa/ Leisure centre, bars, restaurants, private dining, atrium coffee lounges and a range of luxury bedroom formats. Subtly linked to the luxury Hilton there is also a Hampton by Hilton hotel wing which offers mid-range accommodation. Apparently this is the only location in the UK where two Hilton hotel brands operate within the same building. The Architecture is good quality and it does feel quite special. The FA centre, whilst fairly simple and understated externally, is seriously impressive internally. The main reception is within a three storey atrium which is decorated with manikins on the walls with multicolored football shirts on (click here to see it). There are a wide range of changing facilities on the ground floor which include the “Elite” rooms, used by the England squad. These are actually not as lavish as I’d have anticipated, but do have ice baths – and lots of vanity mirrors/ worktops! At either end of the building are substantial sports halls. The walls are generally clad with Kalwall, a translucent material which allows lots of natural daylight through. North facing roof lights also maximise natural light. One of halls is used for Futsal and has a sprung floor, coated with a blue rubberised material. This gives the large space amazing acoustics. In the second larger hall is a full sized football pitch made of artificial ‘3G’ grass. The is naturally ventilated and has a glazed wall down one side with views out over the woodland. Despite the fact you are covered from the elements, this does feel rather like an external space/ pitch. Alongside the pitch is a running track. This has blown ventilation tubes for cooling and to simulate an external environment. It also has HD cameras and speed traps to record, in minute detail, the footballers training/ development, especially for injury problems. Externally are a wide range of immaculately groomed and lush pitches. the one situated right next to the building is a full scale exact replica of the Wembley stadium pitch, including all dimensions, gradients and the grass of course. Full Hydrotherapy centre which includes; a full size swimming pool with an automatic movable floor, an underwater treadmill (again with monitoring HD cameras) and a hot & cold hydro pool. A full gymnasium suite. This is long and narrow in plan form and has extensive glazed walls looking out over the football pitches. This is to help players focus physiologically on ‘where they want to be’. All in all, St. George’s Park is a hugely impressive complex. Surely our England squad are fully equipped with every possible aspect of support and training to help us return to a winning 1966 form? The expectations from England for Brazil 2014 are perhaps greater than ever now! To see more of SGP, its well worth booking a tour – or take a look at this extensive 360 virtual tour here.